Just as all the water in the vast, deep ocean is of no use to a thirsty pilgrim, all the profound wisdom in the vast ancient scriptures of India is useless to the seekers of knowledge unless they can apply at least some of it in their everyday life. The Bhagavad Gita is like a small, deep well of sweet water just off the shore of the ocean. The problem is that the water cannot be easily drawn up from that well. The water dispensed by the guardians of this well does not taste like it came from that well. This book is like a small jug tied to a long rope using which one can draw up some sweet water from that well and quench one’s thirst. 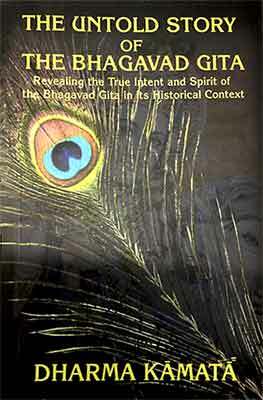 The main goal of this book is to bring to the general public the true intent, spirit and wisdom in the Bhagavad Gita. It is the result of fifteen years of study and research of the sacred book of the Bhagavad Gita. Because this book deals with the little known aspects of the Bhagavad Gita, it might arouse incredulity, anger and hostility in some readers who are not aware of its basis and context. Truly spiritual people, who are endowed with divine qualities, will refrain from indulging in personal attacks against the author of this book before reading the entire book, just because their view differs from that of the author. Sensible point by point contradiction or rebuttal, civil debate on the merits or demerits of the book, and intelligent argument against its basic thesis are always welcome. Everyone who is familiar with the Bhagavad Gita knows its Mahabharata context. However, there is another context to the Bhagavad Gita: Historical. This context consists of decadence of Orthodox Vedic Dharma, commonly known as Brahmanism, and rise of various heterodox Dharmas during the post-Vedic period (900-200 B. C. E) in opposition to it. The Original Gita was composed in defence of the class system known as Varnashrama Dharma, one of four pillars of Brahmanism. In a sense it was the “Policy Paper” on the Brahmanic doctrines of the Gunas and Karma on which Varnashrama Dharma rested. There are 64 shlokas of the Original Gita in the current text of the Bhagavad Gita. Various later interpolations into its text were made by the Upanishadic and Bhagavatha seers in an attempt to overthrow Brahmanism and by Brahmanic seers to reestablish it. The Bhagavad Gita is not just a dry and esoteric document elucidating ancient Indian philosophy. It is a dynamic text which brims with conflict, energy and practical wisdom. One can discern a battle of wits between two groups holding diametrically opposite views. Without examining and understanding the historical context in some detail, it is well nigh impossible to properly reconcile all the contradictions glaringly evident in the text of the Bhagavad Gita as it exists today. 1. The Brahmanic Gita promoting the doctrines of the Gunas and Karma (3:5, 27, 33; 18:59-60). 2. The Upanishadic Gita promoting the doctrines of Knowledge of Atman and Buddhiyoga (2:39-40). 3. The Bhagavatha Gita promoting the doctrines of Lord Krishna as the avatar of the Supreme Lord and Bhaktiyoga (18:64-66). In the text of this book, the Brahmanic shlokas and concepts are shown in Orange color; the Upanishadic shlokas and concepts in Blue color, and the Bhagavatha shlokas and concepts in Green color. All these Gitas address the three fundamental issues raised by Arjuna in the battlefield of Kurukshetra just as the Great War was about to ensue: Shokum (Grief), Dwandwam (fickleness or unsteadiness of mind as a result of loss of wisdom, engendered by mind’s attachment to sense objects) and Karmaphalam (good and bad consequences of action). As a result of these three issues, Arjuna suffers from a paralyzing emotional crisis resulting in a massive panic attack (1:28-30). 1. Anticipating death of his own people, Arjuna suffers from Shokum (1:47). 2. His attachment to his own people causes him to suffer Dwandwam (1:35-37): Should I fight to gain back my kingdom or should I just walk away? Should I kill them or should I die in their hands unarmed and unresisting? 3. Arjuna fears incurring sin -bad Karmaphalam (1:36)-in the act of killing his own people, and consequently going to hell. The apparent agenda of the Bhagavad Gita: How to overcome Shokam, Dwandwam and Karmaphalam consequent to desire for, attachment to and possessiveness of sense objects (people, power and wealth) and desire-driven action by means of Knowledge of Atman/Brahman/Lord and Buddhiyoga. Isn’t this all there is to the Bhagavad Gita? Everyone knows this. What, then, is the Secret Code of the Bhagavad Gita? The Secret Code of the Bhagavad Gita is that, in fact, it is the manifesto of a great socio-religious revolution to overthrow the decaying Orthodox Vedic Dharma (Brahmanism) and to establish in its place a New Dharma centered on Lord Krishna. The Brahmanic Dharma rested on the doctrines of the Gunas and Karma. The doctrine of the Gunas said that one’s socially designated duty/action is determined by his inherent Guna (Quality) rooted in Nature (Prakriti) (3:27). Everyone acts helplessly under the spell of their Gunas (3:5). It is futile to even try to resist them (3:33). Anyone who thought he could defy the dictates of his Guna and act as he chooses is suffering from the delusion of Ahamkara (egoism) (3:27). The doctrine of Karma said that all actions are determined by the Gunas and they earn Karmaphala (fruits, consequences). Depending upon good or bad quality of these actions, one goes to heaven or hell after death. After exhausting his merit or demerit in heaven or hell, he returns to earth to live out his comeuppance in another life (9:20). The Brahmanic Dharma was held up by four pillars: sacrificial rites (Yajna, Karma) dedicated to the Vedic gods (4:12; 17:4); hierarchical class system based on the Gunas and Karma known as the Varnashrama Dharma (18:41-45); sanctity of the Vedas (17:23-24), and supremacy of Brahmins over the other three classes (18:42). Because Varnashrama Dharma, based on the doctrines of the Gunas and Karma, gave Brahmins supremacy over all other classes, they developed pathological vested interest in perpetuating it. During the post-Vedic period (900-200 B. C. E) the upper classes of Brahmanism -Brahmins and Kshatriyas- became obsessed with ostentatious desire-driven sacrificial rites, known as Kamya Karma (18:2). Kama (hankering for wealth and cows seen in priests officiating sacrificial rites) and Sankalpa (desire for lordship and heaven in the Kshatriyas sponsoring the sacrifices, 2:43) became hallmarks of Kamya Karma. Kamya Karma became the outstanding symbol of corruption and decadence of Brahmanism (3:12-13; 16:12-20). Obsession of the upper classes with Kamya Karma had serious consequences in the society. In the course of time, the upper classes suffered from the same three maladies Arjuna suffered on the battlefiled: severe Dwandwam in their pursuit of Karmaphalam; and the rest of the society suffered much Shokam due to loss of innocence. Large sections of the society, including many grief-stricken Brahmins and Kshatriyas, began to abandon Brahmanism in favor of various heterodox Dharmas such as Buddhism and Jainism. Soon Brahmanism was in grave danger of disappearing altogether. An internal revolution to either reform Brahmanism; or salvage what little was left of it, or replace it with an entirely New Dharma became an urgent necessity. The New Dharma, successively engineered by the Upanishadic and Bhagavatha seers, rested on the doctrines of Lord Krishna as the avatar of the Supreme Lord and Bhaktiyoga. The two pillars of this Dharma were the two aspects of the Upanishadic doctrine of Buddhiyoga: Sanyasa (detachment from sense objects 5:1) and Tyaga (renunciation of fruits of action 2:51). Thus Sanyasa countered Kama, of Kamya Karma, and Tyaga countered Sankalpa of Kamya Karma. In the Bhagavad Gita, Lord Krishna, the Hero of the revolution, systematically dismantles all aspects of the Brahmanic Dharma beginning with its very foundation: the doctrines of the Gunas and Karma (2:45). He offers Himself as the power greater than the Gunas (7:14; 14:19). He discredits the Gunas as the seat of all common human weaknesses such as desire, attachment, possessiveness and rage. Taking refuge in Him alone would help one to overcome the force of the Gunas. Surrendering to Him alone in Bhaktiyoga one would overcome the doctrine of Karma and attain Moksha (18:66). He goes on to downgrade or condemn Vedic ritualists (2:41-44); the Vedas (2:46, 52-53); Kamya Karma (2:47-51), and the Varnashrama Dharma (5:18-19; 6:29). The true spirit of Lord Krishna’s Dharma in the Bhagavad Gita is exactly opposite of Brahmanism: to establish a New Dharma centered on One God; worship of that God by Bhaktiyoga (Bhakti combined with Sanyasa and Tyaga); equality of all people regardless of their birth class, caste or family; simplicity of life based on detachment from sense objects and selfless service to God and humanity. 18:66: Abandon all Dharma (Brahmanism and all its sub-Dharmas such as Varnashrama Dharma, Jati Dharma and Kula Dharma; and also all heterodox Dharmas: Buddhism, Jainism and Ajivika,) and surrender unto Me alone (not to the doctrines of the Gunas and Karma; or other gods, such as Indra and Agni, because now I am the Eternal Dharma 14:27); I shall liberate you from all evil (Shokam, Dwandwam and Karmaphalam engendered by the doctrines of the Gunas and Karma); do not grieve. With this one shloka, Lord Krishna ended the decaying Brahmanism and all other Dharmas of the land and launched a New Dharma. Right? Well, let us not be presumptuous. This book also explains how and why, in spite of Lord Krishna’s revolution to overthrow it, Brahmanism survived and even thrived to the modern times. All discredited aspects of Brahmanism infiltrated in disguised forms the egalitarian Hinduism, which succeeded it. Thanks to Brahmanic death-grip on it, today Hinduism is riddled with thousands of mindless and vulgarly ostentatious rituals, and senseless superstitions, so characteristic of the decadent Brahmanic Dharma. And it is treading the same ruinous path that Brahmanism took 2,500 years ago. Lord Krishna’s revolution against Brahmanism in the Bhagavad Gita has been cleverly hidden from the public by Brahmanic vested interests by means of brilliant feats of verbal gymnastics, literary manipulations, distorted interpretations, blatant misrepresentations and long-winded commentaries. In fact, the very manifesto to overthrow Brahmanism has cleverly been converted into the handbook of Brahmanism! Lord Krishna’s Revolution to overthrow Brahmanism has been thus totally neutralized. This book exposes this grave injustice against Lord Krishna and His revolution, and reveals the true intent, spirit and wisdom of His Gita. Those who are not familiar with the Bhagavad Gita are recommended to have a copy of the Bhagavad Gita at hand when they read this book. I recommend The Bhagavad Gita with Sanskrit Text, translated by Swami Chidbhavananda, Published by Ramakrishna Tapovanam, Tirupparaitturai, Tamil Nadu. This is an excellent small, 247 page, handbook without any commentary by the Swami. The same author also published another book with extensive commentary. The translations in the Secret Code book are mostly taken from his book. You may download a complete version of the book from here.